An IVC filter is a small cone shaped device inserted into the inferior vena cava artery. It is designed to “catch” blood clots and keep them from traveling into the heart or lungs. The newer devices are designed to be optionally retrievable. The main 3 issues (failure mode)with these filters which cause injury are migration, perforation and fractures. Migration is when the entire filter breaks loose and travels to the heart or lungs resulting in death. Perforation is when the legs of the device stab through the vena cava and penetrate surrounding organs which include the aorta. This is the most frequent of the . 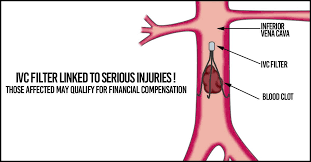 Fractures happen when one or multiple legs of the device break off and travel through the blood stream to the heart or lungs or enter other areas of the body. The fracture rate is 5 years after implantation but that does not mean that fractures cant happen or haven’t happened prior to the 5 year mark. Another downside of this device is that it can be prothrombotic if the device is tilted. Blood can collect around the device and clot and if the device isn’t in place, the clots can still travel past into the heart or lungs. 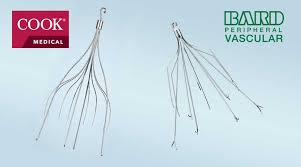 There are 11 companies who sell these IVC filters. The five products that are most often involved in litigation is the Bard Recovery filter, The Bard G2 filter, the Bard G2 Express filter, the Cook Gunther Tulip filter, and the Cook Celect filter. The Bard Eclipse, Bard Meridian and Bard Denali are also causing problems. Laird, Baker and Blackstock is currently evaluating cases for potential claims against the manufacturers of failed, broken, or damaged IVC filters. If you have had an IVC filter implanted to prevent the migration of blood clots and have experienced any of the above symptoms, you may have a case. Call our office or click the link below to schedule a free consultation. There is not a fee unless we recover.